What’s the difference between wheel nets and what’s the best wheel net for large tires? You are here: Home > What’s the Difference Between Wheel Nets and What’s the Best Wheel Net for Large Tires? Choosing a wheel net can be confusing and it’s by far one of the most common questions we get at USCC since there are so many variations of vehicles, tires, and towing applications. A few things to note: side mount wheel nets should not be used on dollies because the dolly ratchet assembly is on the front. These are used on just trailers. Also, the side mounts aren’t secure enough for a dolly in most cases; instead, all four tires should be tied down with these straps. For securing truck tires and large tires, choose an adjustable wheel net or double adjustable wheel net. The design lets you adjust the strap around the tire to accommodate the size. 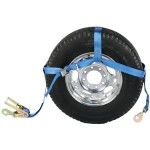 You can see this page: Wheel Nets, Auto & Car Tie Downs and Tow Dolly Straps for all of car carrier straps and supplies. We’re working on a series of wheel net videos to show the difference between the many options- keep checking back!